A youth (identified as Sabuna wiri Tembura, i.e. 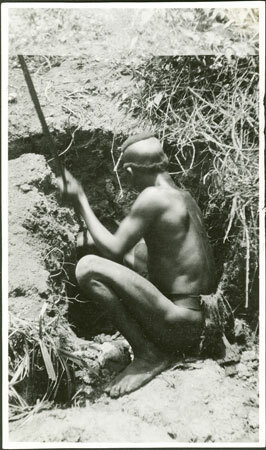 Sabuna, son of Tembura) digging clay from a pit in an alluvial channel using a stick, for use in pot-making. His hair is shaved so as to leave a patch on top and around the base. Notes on print/mount - "Sabuna wili Tembura digginf clay for pots 72/1 1 EPA697"
Notes on card mount m/s pencil - "RCS upper RHS corner SSS overall 8.89"
Morton, Chris. "Digging clay for Zande pots" Southern Sudan Project (in development). 03 Jan. 2006. Pitt Rivers Museum. <http://southernsudan.prm.ox.ac.uk/details/1998.341.697.2/>.